For as long as I can remember, I have always been a fan of Lewis Carroll and Alice’s Adventures in Wonderland and of course the ongoing story for when she returned to Wonderland through the Looking Glass. Of course using the term “fan” for me when it comes to Wonderland is explaining my adoration of the story and characters lightly. I have a near borderline obsession over all things Wonderland. Who can blame me? Needless to say my obsession has grown into collections of dolls, stuffed animals, figurines, and collectibles, and of course books all devoted to Alice and the Wonderland friends and enemies she comes across in her travels. 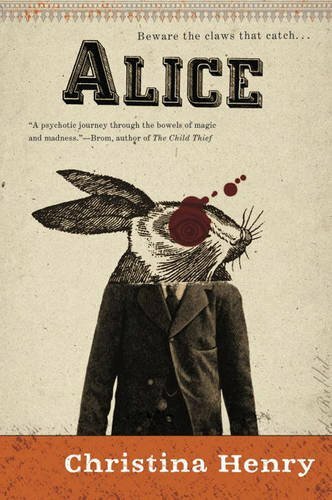 Whenever I find a new interpretation of Alice’s story I am intrigued to see how the author has created her Wonderland. In Alice, Christina Henry does just that. We meet Alice when she is locked in an asylum, medicated and with no belief that Wonderland exists. Alice’s only companion is her fellow asylum patient, Hatcher. In Alice, there is certainly a tea party and there is quite a bit of madness… okay a lot… but there is no Hatter. That’s fine by me because Hatcher replaces the Mad Hatter quite nicely in my opinion. Still for my fellow Wonderland fans, Christina Henry does not disappoint with acknowledging the presence of the beloved, well-known characters such as the Walrus, the Cheshire, the March Hare, the White Rabbit, and the Dor Mouse. I truly loved Henry’s interpretation of the Dor Mouse and the White Rabbit as it was a unique twist to those we have come to know so well in Wonderland. Really, Alice is a completely different take and twist on Alice in Wonderland. Think Gangs of New York meets Wonderland and you will have Alice. In Alice Hatcher and Alice escape the asylum only to find that the fire has also released the Jabberwocky that has been imprisoned below the asylum. As the story continues, Alice begins to recall more of her memories of what happened before she was in the asylum and also discovers more about Hatcher and who he was before the asylum. Alice’s adventures take her through the streets, each sector individually controlled by a Boss who in turn are torturing and selling the women in their portion of the city. Hatcher and Alice literally have to hack and slash their way through the streets in order to get to their final destination… to find the Rabbit. If you love Wonderland and have a taste for a different spin on the story, this is the book for you. Henry makes Wonderland her own without disrespecting or taking from the Carroll classic. The imagery is dark and gritty with its own manipulation of what truly is madness. While the story is dark, Alice reminds us that Wonderland was not always madness and malice… it was also magic. There within the magic is the light that brings this book its true shine. In smaller ways of expression, I loved this book. I truly hope that she continues Alice and Hatcher’s adventures. Until next time readers, enjoy your world of imagination. May it bring you much Madness and always… Magic.